Afraq, in the Jordanian desert, will alleviate the flood of Syrians into Zaatari. Officials in the country say it’s about time — but that the camp’s far-out location could stymie the growth of its economy. In 2012, UNHCR built the Zaatari camp in just two weeks in order to accommodate a massive influx of refugees, and it quickly became overpopulated, expanding rapidly to meet housing, healthcare, food distribution and security needs. Last week the Jordanian government and the U.N. opened the $63.5 million Azraq refugee camp. Designed to accommodate 130,000 Syrian refugees, it could become the second-largest camp in the world. After complaints from residents and donors alike over the crude tents originally erected at Zaatari and winters that saw shortages of essentials like blankets, officials say Azraq’s design and management is mindful of lessons learned and will employ a “village” concept with decentralized services and facilities. Here, UNHCR’S external relations officer Andy Needham and Andrew Boscoe, Oxfam’s Zaatari program manager and interim Jordan country director, weigh in on the need for a new camp. Syria Deeply: How great was the need for a new camp? Andrew Boscoe: Azraq has been under discussion for a very long time. UNHCR and other actors spent a long time looking for a site. The Jordanian government said to use Azraq, but most organizations were opposed to the site at first because it’s very isolated, it’s out in the desert and not near a major town. So it’s harder for refugees and aid [to get there]. The fact that Zaatari is at capacity has put pressure on the government to open Azraq. But the government said it was there or nowhere, so UNHCR agreed to it. There’s a need for a new camp, definitely, because we’re at capacity, somewhere around 100,000 residents. There’s been a big increase in the population numbers over the last two or three months, and as you drive or walk around, you can see it’s filled up. The opening of Azraq has been announced three or four times [and not happened], but I think now the fact that Zaatari is at capacity has put pressure on the government to open it. Syria Deeply: How do international organizations feel about the camp’s location? Boscoe: Azraq isn’t in the best location, partly it’s because it’s an out of the way site. It’s way out in the desert. Zaatari is very close to Mafraq [a city of nearly 60,000], and there is quite a lot of trade [between the city and the camp] even though there’s not supposed to be. Syria Deeply: How many new arrivals have you seen since the opening of the camp last week? 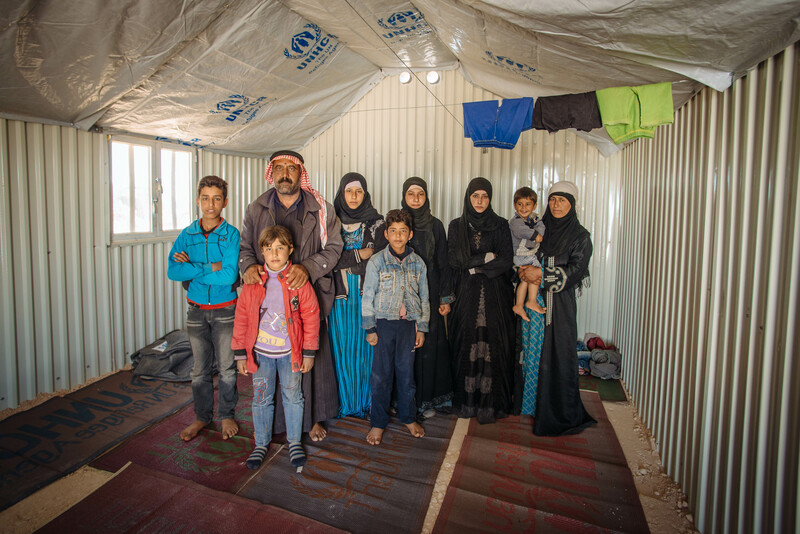 We have had requests for families here to be reunified with family members in Zaatari. Andy Needham: We had a soft opening of the camp last Wednesday, and up till Thursday of last week new arrivals were continuing to go through Zaatari. As of Friday we began to accept all new arrivals, and are so far hosting 1,133 refugees. Over 50 percent are children, which is similar to what we are seeing at Zaatari. We have had requests for families here to be reunified with family members in Zaatari here in Azraq, so we have decided to take in refugees that are already in the country to reunite families. Syria Deeply: What lessons from Zaatari have you applied to the design of Azraq? Needham: The government made the land available in Azraq last March, so over a year’s worth of planning, development and construction has gone into the refugee camp, which is an unusual set of circumstances in refugee response. The Azraq camp was designed to look and function like a real city, as opposed to an emergency camp. There are paved roads that connect to villages that are divided into slots where the shelters are located. There are two hospitals, two schools, 2,000 sanitation facilities, mosques, community centers and supermarkets. So far, UNHCR has built 2,500 shelters, and the villages offers community centers, clinics, parks, playgrounds, police offices, private cooking and cleaning areas. There are two hospitals, two schools, 2,000 sanitation facilities, mosques, community centers and supermarkets where Syrians can buy food with WFP rechargeable aid cards. It’s the first time in a camp that a supermarket has been open since day one of the refugee camp. At the hospital, there are 130 beds available for secondary level care. It’s unusual to have a secondary level care hospital. Often refugee camps have primary level camp hospitals, but this hospital handles maternal deliveries and elective surgeries and offers services like ophthalmology and dentistry. There are two schools in the camps. The first school is available to the children who have arrived already but are only getting informal education for their basic needs. Their formal education will start at the beginning of the school year in September, when there is a larger critical mass of children in the camps. Boscoe: What I’ve heard is that they have a flat-pack IKEA type of housing that’s secured into the ground, whereas in Zaatari they were all in tents at the beginning, and now many are in caravans [trailers] donated mostly by the Gulf states. People can move their caravans around. You’ll find the wealthier refugees now have three or four caravans. At Afraq, the plan is to resolve that with this new [housing], with something more grounded. But I’m sure they’ll figure out how to move them eventually. Afraq will have markets. Here at Zaatari there are two fairly big camp markets and supermarkets. In Azraq, because it’s more isolated, there’ll be fewer work opportunities and less money circulating in the camp, so it might mean that there’s less [industry] in Azraq. Syria Deeply:How are you minimizing the camp’s environmental impact on Jordan? In the next few weeks we are installing solar lighting systems in all the villages. Needham: Jordan is the world’s fourth most water-scarce country, so water is a major issue for us. In Zaatari, water was being delivered through a tank system, and tanks were often leaking or left running. In Azraq, water is delivered through taps, which has helped minimized water wastage. In Zaatari, the electricity was connected to the local street light electricity system, which wasn’t planned for. At present, there is no electricity available because of Azraq’s distance from other communities. In the next few weeks we are installing solar lighting systems in all the villages, near public areas and toilets, so we can avoid draining the Jordanian electrical grid. Syria Deeply: How could having Afraq as an option impact Jordan’s urban refugees? Needham: About 80 percent of Syrians in Jordan live in urban areas. Syrians aren’t allowed to work in Jordan, but many Syrians are choosing to live in urban areas where they are closer to employment opportunities. But in urban settings, they have to pay rent and it is hard to make ends meet, so we expect people will have to come back to camp settings. Katarina Montgomery and Karen Leigh.